PMF gives you a lot of flexibility in dealing with measurements. It supports quick one-off measurements you might add when prototyping a new scorecard, and it also allows you to design deeply loaded measures that span multiple time periods. PMF supports measure pooling, which enables you to create measures independent of specific scorecards. You can create a measure and link it to every scorecard in your organization, or unlink a measure and hold it for later use. Linked measures are controlled by data access security, which allows users to view only measures to which they have been granted access (for example, through an optional Organization dimension). You can manually add one or more measures to PMF and quickly connect them to objectives in your system. Each of these user-entered measures takes about a minute to add with the New Measure Wizard. For more information, see Working with User-Entered Measures. If you set up your scorecard using the Scorecard Wizard, and you selected objectives from the list, PMF automatically created measures for you. You can use the Measures panel button to edit these measures or convert them to loadable measures. After you have loaded measures with the loader, use the Edit Measure panel to edit their properties. Note: This feature is deprecated in PMF 8. Use captured sources instead. Measure data cannot be loaded (no available data source). The measure will always be entered by a user or manager. There is no planning system to obtain metric targets. Loading metrics would require mass-adjustments to correct inaccurate data. 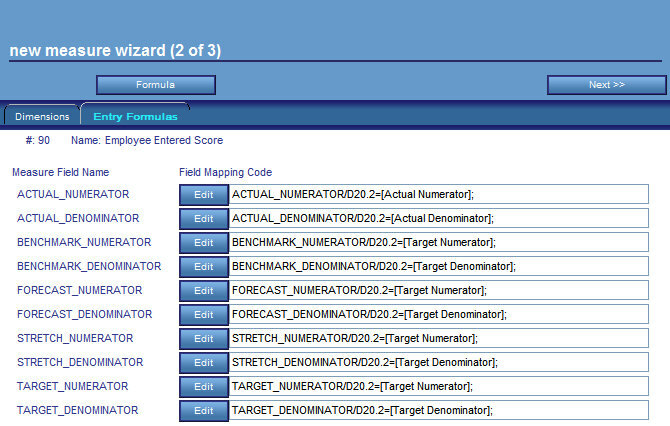 Determines which groups of end users (by Role settings) entered actuals and data for targets. Provides an intrinsic data store for metrics components. A user-entry screen is accessible directly from a URL. From the Author or Manage tab, select the Measures panel button. To create a new user-entered measure, select New. To view or edit an existing user-entered measure, select the desired measure in the User Entered Measures folder of the tree structure. After measures are created, they are immediately available on all linked scorecards. If data for a user-entered measure becomes available at a later date for loading from a data source, you can change the measure to be loaded from external data. You can also change a measure currently loaded from external data to a user-entered measure. To do either, edit the Measure Type field in the Edit Measure Metadata panel. Users can enter data for a user-entered measure by selecting Measures to Input from the drop-down menu near the upper-right corner of the Today tab. For more information, see Inputting User-Entered Measures. In the Author tab, click the Measures panel button, then click the Wizard button. 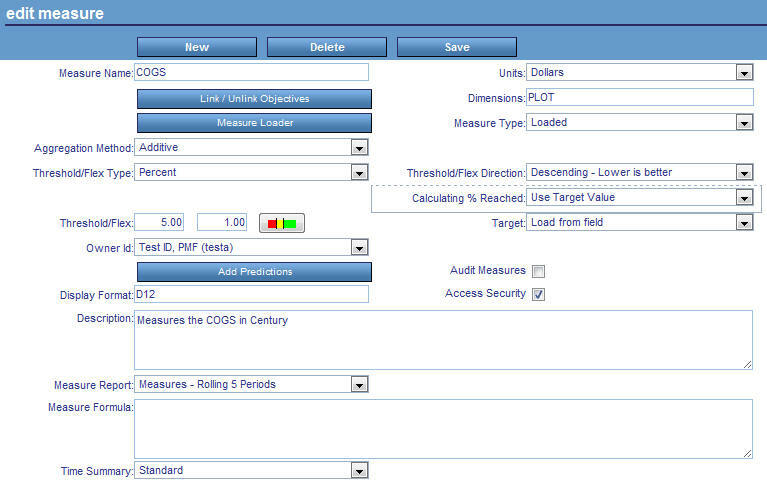 The New Measure Wizard panel opens, as shown in the following image. Specify values for the fields in the panel. The following table lists and describes the fields. Name of the measure. Links to the SERIES field in each atomic measure record. A measure name is linked to a single measure or a pool of production measures. It is used in views that need a common measure name for the often disparately named measures in a particular linked series. The maximum number of characters is 50. Scorecard to which the measure is linked. This value can be set to a scorecard or left blank if the measure is in the measures pool but not attached to a particular scorecard. Objective to which the measure is linked. Choose an objective from the drop-down menu. This field is blank if the measure is unlinked (most typically an unlinked measure is used when creating a relaxed measure). If the scorecard field above is blank, this field should also be left blank. Method you can use when aggregating this measure in views. Select Additive for measures that represent linear quantities (for example, Dollars, People, Hours, and so on). Select Percentage if the measure represents a percentage, so that aggregation can correctly account for separating the numerator and denominator. This aggregates them and then divides the sum. Select Change in Percentage when the stored values for the measure represent a change from one time period to another. For example, if sales were 10,000 in January and 11,000 in February, the change from January to February is 10%. For regular percentage-based measures, the system stores both a numerator and denominator to correctly sum the measures; for the given example, the stored values would be 1,000 and 10,000. However, unlike percentage-based measure series, Change in Percentage ignores the sign of the denominator. If the January value is -10,000 and the February value is -9,000, the stored values are 1,000 and -10,000; however, the change in percentage is still 10%. The actual calculation of subtracting the January data from the February data is done during the load phase. Select Ratio to display decimals for measures. For example, a ratio measure displays as .89 where a percentage measure displays as 89%. Note: Both Ratio and Percentage measure types allow you to use separate numerators and denominators for measure actuals and targets, thus ensuring proper aggregation at every dimensional level. These aggregation types are automatically supported in the measure loader and in all PMF views. Unit of measure used for this measure. Select a value from the drop-down menu. If you do not see the value you need, you can add it using the Units of Measures panel. The one-character dimension identifier or identifiers to which the measure is linked. For example, the value TOP means that the measure is linked to the Time, Organization, and Product dimensions. The first field is the value to be used for the threshold, which determines when an indicator shows red. The second field is the value to be used to determine the inner edge of the yellow zone. Setting a flex of 0 indicates that the measure does not allow any deviation from the target. Click the red/yellow/green icon to display a grid that enables you to graphically adjust the threshold and flex values. Description of the data loaded for this measure. The maximum number of characters is 1024. Select an operational or PMF measure view from the drop-down menu to enable users to automatically drill down that view from this measure. Option to vary how measured data is aggregated over time. Select Standard to aggregate using standard Time rules. All of the measure data shown at higher time levels adds up to the total of all data at the lowest loaded level (for linear aggregation) and includes all percent or ratio data over the entire time period (for percent, ratio, and change in percent aggregation). This option is the default. Select Average to show an average value, which calculates a mean average of all the data loaded across the lower Time levels for the duration of the higher level period. Select Most Recent to show the latest values. Only the most recently loaded value of all the data loaded across the lower Time levels for the duration of the higher level period will be shown. Note: These options will only be available if the Alternate Time Summary setting in the Summarization settings is enabled. After you verify the values specified for all of the fields on the panel, click Next. The New Measure Wizard (2 of 3) panel opens displaying the Dimensions tab, as shown in the following image. The following table lists and describes the fields on the Dimensions tab. When this option is selected, which is the default, PMF requires the case of the dimension values to match the data source exactly. If there is a mismatch on the dimensionality, it will be flagged as an error. When this option is not selected, PMF uppercases everything before comparing the dimensionality. After you verify the values specified for all of the fields on the Dimensions tab, click the Entry Formulas tab. For each field that displays an Edit button, type a value or a formula to calculate a value in the field to the right of the button. If you have a long formula to enter, click the Edit button, enter the formula in the Field Map input area that opens at the top of the panel, and then click OK.
After you verify the values and formulas specified on the Entry Formulas tab, click Next. The New Measure Wizard (3 of 3) panel opens, as shown in the following image. The panel that displays enables you to test entering measure actual, benchmark, forecast, stretch, and target values if desired. You may want to input target values for a measure, since users typically input only actual values, or you might reserve this task for planners or managers at your site. If you create formulas for the actual and target values of user-entered measures, users are presented with a multi-cell calculation screen when entering measures. PMF displays the results of the calculation for user verification. You can specify which users have access to enter actuals or targets by setting access for their Functional Role from the Manage tab. For more information, see How to Limit Functional Roles to Enter Only Actual or Target Values. In the Author tab, click the Measures panel button. The Edit Measure Entry panel opens where you can edit any of the settings. Click the Measure button to edit any of the fields in the Edit Measure panel. This panel contains the same fields available when the measure was created in the New Measure Wizard panel, plus additional functionality including buttons to Link/Unlink Objectives and Configure Prediction Processing. Tip: You can convert user-entered measures to loaded measures by changing the Measure Type from User Entered to Loaded. To edit any of the target or actual formulas, select the Entry Formulas tab or click the Formula button. To enter any target or actual values, click the Enter Measures button. Note: In each panel where you make changes, click Save before moving to another panel. When you are ready to load production measures from operational data, you can review and edit the properties for specific measures before loading. You may want to adjust the Threshold, Flex, Alert Threshold, and Alert Flex settings to ensure that they reflect the data you are about to load. If you have any user-entered measures that can now be loaded from a data source, you may want to convert these measures to loaded measures. Select the Scorecards panel button in the Author tab and fully expand the resulting tree structure all the way down to the measure level. Select the Objectives panel button in the Author tab and fully expand the resulting tree structure down to the measure level. Select the Measures panel button in the Author tab, select a measure in the User Entered Measures folder, and then click the Measure button in the Measure Entry panel. 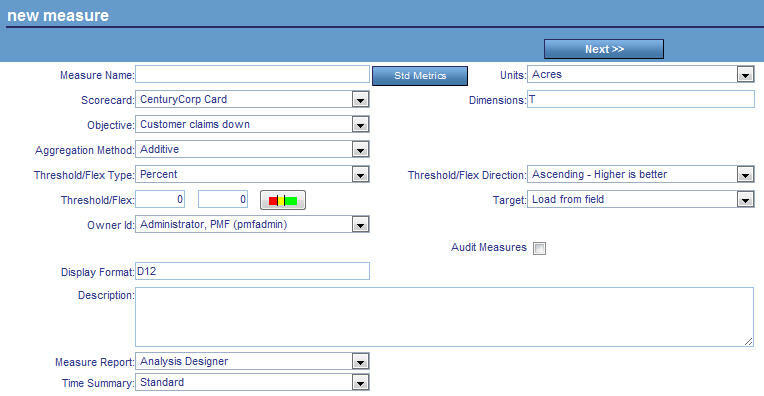 Select the Measures panel button in the Manage tab and expand the tree structure to the measure level. Selecting any of the individual measures opens the Edit Measure panel where you can view, edit, or delete measures. The following image shows the Edit Measure panel. The following table lists and describes the fields in the Edit Measure panel. Displays the Link Measures to Objectives panel, which enables you to link the measure to additional scorecards and objectives. For details on this panel, see How to Link Measures to More Objectives. Available only when the selected measure is a production measure. Displays the Measure Loader panel, which enables you to design and complete a measure load. Method you can use when aggregating this measure in views. For details, see the Aggregation Method table entry in How to Create a User-Entered Measure With the New Measure Wizard. Basis used for calculating the percent (%) reached for the descending measure. Sets a basis value for calculating Pct Reached. This is especially useful if you have a target at, or near to, zero. The Basis determines the amount above your target at which Pct Reached = 0%. This prevents very large negative Pct Reached values from being displayed. This option is only available for Descending Measures. Displays the Configure Predictive Data panel, which enables you to select options for predictive data analysis. When this check box is selected, data is filtered using access security at the security level of the user. Loading measures tends to be an administrative function. For more information, see Performance Management Framework Administrator. Click the Scorecards panel button. Expand the Scorecard, Perspectives, and Objectives folders. Select the objective you want to use. The Edit Objectives panel opens. The Link Measures to Objective panel opens, as shown in the following image. In the Link? column in the Measures Available to be Linked section of the panel, select the checkbox across from the desired measure to link the measure to the objective. Click the Adjust Measure Weights button to weight the measure across the selected objective. For details on the Weight Measures Across Objective panel, see Weighting Measures Across Objectives. To remove a linked measure, click the Unlink? checkbox under the Measures Currently Linked section of the panel.